Lifewater International works with Divine Waters Uganda, a registered Ugandan NGO, in northern Uganda to build hope through commmunity empowerment. Water, sanitation and hygiene education coupled with safe drinking water builds a soild foundation. Lifewater has partnered with Divine Waters Uganda for 10 years and has trained the staff of the organization in Sanitation, Hygiene, Biosand Filtration, Hand Pump Repair, and Well Drilling. Divine Waters Uganda is the implementing partner based in Lira and has served rural communities in northern Ugandan since 2001; they started work in Abako Sub-county in 2009. Divine Waters Uganda is currently working with LIfewater in Ogur and Abako Sub-Counties on a three year program, which started in 2009. The program goal is to reach over 70,000 beneficiaries with safe water and over 65,000 beneficiaries with hygiene and sanitation education in 271 villages. Amononeno school is located in Abako Subcounty which is divided into 7 parishes consiting of 135 communities with an estimated population of 47,046 (UNOCHA). Since the end of the LRA war, very few if any NGO's have worked in Abako Sub-county. Water coverage exists at 56% with 19% of the water sources not functioning. Community members from the surrounding villages will have limited access to water from the school borehole. Approximately 400 people in addition to the school children could benefit from this borehole. A borehole with a hand pump will be drilled at Amononeno School providing safe water for 646 boys, 621 girls and 25 teachers and staff. 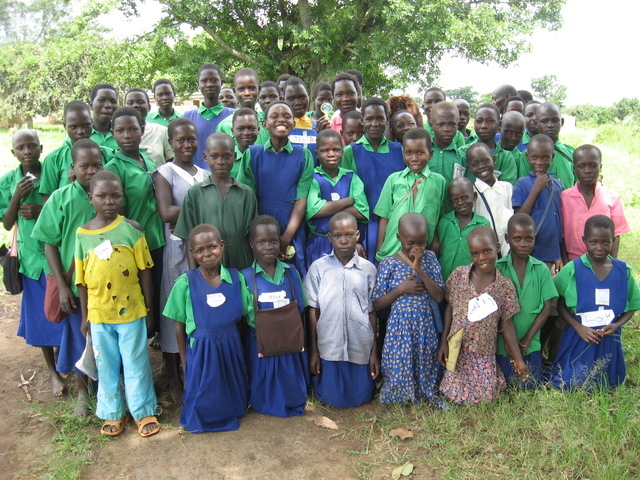 Demographioc information was obtained by Divine Waters Uganda from the school administration. WASH in Schools training incorporates sanitation promotion. Topics covered include latrine use, latrine construction, why it is important to use latrines, and latrine maintenance. Hygiene education designed especially for primary school children focusing on hand washing, latrine use and maintenance, safe water transportation and storage. Based on the local climate and geologic conditions, borehole drilling is the best option for providing water to the school. A geologic survey will be completed to determine the location for drilling and the equipment required. At this time, it's believed a deep well drilling machine is needed. Once the well is drilled, Divine Waters Uganda will install an India Mark II hand pump. Water quality is sampled and tested following drilling and the installation of the hand pump and its disinfection. A well log is filed with the Divine Waters office in Lira. Lifewater hosted a 5-day WASH in Schools training workshop for Abako school teachers in May 2010. The teachers will implement the curriculum and receive refresher training. Divine Waters Uganda will train a Water Source Committee made up of men and women from the community and the school faculty in wellhead protection, hand pump maintenance and administration. Divine Waters helps the community form this committee, encouraging gender equality and advocating for diversity in membership among various age, trade, and ethnic groupings. The committee oversees the borehole, ensuring its proper use, preventing quarrels, and setting up a fund for future repair needs. Divine Waters Uganda works closely with the government at the local, Sub-County and regional levels. This work plan has been submitted to and approved by the Lira District office and Sub-county offices. The District and Regional offices have resettlemnt plans for northern Uganda, which include repare of infrastructure, such as water systems, rebuidling schools, and construction of latrines. This work plan fits within the goals and directives of the local government and a signed MOU is in place, being monitored by the local government. Capacity building of Divine Waters staff by Lifewater is ongoing. For example, teacher training focusing on water, saniation and hygiene was given in May 2010. Plans for kitchen gardens are in place as well as the formation of school health clubs. The school is also involved in environmental activities such as tree planting, which the school health clubs will join. On this three year prgram, Divine Waters employs 15 people from project adminsitrators, to hygiene trainers, community mobilizers, field officers, and water development technicians. Many other donors have already contributed to this program's success; to date, 20 hand pumps have been rehabilitated and 21 boreholes drilled with more than 20,000 receiving safe water. The water source committe will be responsible for collecting a small sum of money affordable at the local household level, which will be placed in a maintenance fund. Additionally, the committee will be trained in basic maintenance of the pump and will be able to call on Divine Waters if major repairs are needed. In-kind contribution includes community members' assistance with preparation of the drill site, and volunteering thier time on the water source committee. The teachers donate thier time to attend the WASH in schools training and the after school health clubs. I understand that you set up a fund for future repairs. Can you tell me how fees are collected? Do people pay monthly, or by the jerican? is it free for the students? Does anyone get paid for repair, or is the committee all volunteer? Does the fee collection cover annual maintenance costs or do they appeal to the government or Divine Waters? Can you tell me a little more about the government engagement/investment? Is Divine Waters and their donors covering all the costs, or is government contributing as well? As the monitoring entity, how often will they visit and what is their specific role? Do they water test? Do they check to see if fees are being collected? I copied and pasted your questions below, with answers. I understand that you set up a fund for future repairs. Can you tell me how fees are collected? Do people pay monthly, or by the jerican? Setting up the maintenance fund is one way that Lifewater ensures sustainability and community ownership of the wells. The implementing partner, Divine Waters Uganda, forms or strengthens a Water Source and Sanitation Committee (WSSC) for each water point. The WSSC along with Divine Waters staff discusses the committee, who and how many people are on the committee, as well as how the committee should collect the dues. Typically dues are paid monthly on a sliding scale so that widows do not pay as much as a family, for example. The method of collecting dues is up to the individual WSSC. Most often, community members pay with money or with crops, animals, or other goods. If someone cannot pay, they may be given one month to contribute what they can afford. In general, people are eager to contribute to the sustainability of the borehole and hand pump. Free for the students? It’s up to the WSSC. Does anyone get paid for repair? Local technicians are paid a small fee for minor maintenance, which gives local well repair teams (often trained by Divine Waters) a source of income. Is the committee all volunteer? Yes, with the goal of 50% men and 50% women. Does the fee collection cover annual maintenance costs or do they appeal to the government or Divine Waters? The fee pays for minor maintenance, and general upkeep. Major repairs, rehabilitations or replacements come would be subsidized from other sources. The government has not been a contributor to pump repair costs. Can you tell me a little more about the government engagement/investment? Divine Waters has a good relationship with the local government bodies and submits water quality tests, reports, and drill logs to the government. The government coordinates and keeps track of the work done by various NGOs in the area, however does not contribute financially to the projects. The government meets quarterly with Divine Waters to check on the progress of the project but Divine Waters monitors the functioning of wells and Water Committees. These roles and responsibilities are spelled out in an MOU signed by Divine Waters and the District Government. The NGOs with outside funding tend to carry the projects on to completion. Is Divine Waters and their donors covering all the costs, or is government contributing as well? Costs are supported by the community, Divine Waters, and its donors. As the monitoring entity, how often will they visit and what is their specific role? Monitoring schedules are being developed, depending on the location and access to nearby roads. Do they check to see if fees are being collected? Monitoring of the WSSC is done in collaboration with hand pump monitoring and one of the inspections is fee collection. Can you clarify more, how a small sum of money are being collected from each household? How much each household pay? Is it paid monthly or yearly? Please clarify the amount that the 400 people getting water pay v other v the school. I understand that children at school enrolled in the school health clubs assist in efforts to clean the water point and latrines as thier gifts-in-kind. The patents of children pay the user fee from the household level. In other words, students do not pay an additional fee, rather, they are covered by thier household. Thanks. The local Water Source and Saniation Committees are made up of influenctial community members, wiht a gola of 50% women. the WSSC sets the fees for each family, based on thier ability to pay. For example, at the lowest end of teh sliding scale, a fee of 500 Ug Shillings (about $0.50) per month may be assessed to a widow. People with higher income tend to pay more. The monthly allowance isprimarily established for two reasons: help build ownership in the use and maintenance of the water pump under the governance of the WSSC; and secondly, to build up a maintenance fund for repair costs which are an eventuality. Since hte end of hte civil war with teh LRA, and the departure of many NGOs, which had created an attitude of dependancy, Divine Waters Uganda has worked hard to bring about transformation in the mindset of people for the repsonsbility of maintaining water systems in a sustainable manner. Community empowerment is taking place to help transform communities through educaton and training of community health workers, and by encouraging people to get invovled and rticipate in the planning and direction of community development activities. After school health clubs will enable children to learn important hygiene and saniation concepts which they can then take back to thier parents at home. please write cleary how many bore holes you want to install. And it is one than please write more about the area how deep you can get water? so members can justify the budget part. The geology in the area consists of crystalline rock, which we anticipate will need to be drilled using a high capacity commercial mud-rotary drilling machine. Because the school has such a high priority for water, Lifewater has budgeted the cost of the resistivity survey which will indicate local fracture patterns, and the depth to water. The contracted price for drilling is approximately $11,000-13,500 depending on depth to water and mobilization costs. Even at this cost, the high number of beneficiaries receiving safe water results is an average price for water at just $8 per person. If the geophysical survey indicates completion of a borehole is possible using a smaller, shallow well drilling machine, Lifewater will contact PWX and request permission to drill additional boreholes to effectively utilize grant funds. it is good to konw about new area as in South India, in our operational area we get water at depth of 15-20 feet. While i understand that you will not know water depths until the survey is done, i am still not clear of the range of depths you are talking about. Any data from other boreholes (about 20 according to the application), water sources, surveys in the area? What is the deepest the handpump is effective at in the field? The rope pump goes to about 60m. Can you also please your number of people getting safe drinking water? I believe it should be 400. That number is for folks who get water on a daily basis. The kids only get it at school and that is a different number. Sorry for the delay. The water table in the crystalline bedrock formations in northern Uganda can be more than 100 meters. A resistivity survey will determine fracture patterns so that drillers have the ideal well location. In this area, the borehole is the last option for water; rainfall collection is not an option due to frequent local droughts and low averages. Surface water ponds are highly contaminated and not sufficient volume for the local population. BSF is also not an option due to scarcity of water resources. The project costs includes the geophyical survey, mobilizatino of large equipment ot the site, drilling, pump installation and water quality testing. Unfortunately, people living in these areas are collecting water from very meager springs, that sometimes result in women waiting hours in line scooping wter in a cup to fill thier jerry cans. The water provided to communities will complement WASH in Schools program focusign on hand washing, safe water storage, and safe disposal of feces through latrine use. This project was designed In an effort to provide a reliable, safe water supply to both students and thier families surrounding the school. Since families tend to number 7-8 members, our estimated beneficiaries inlcude both the children(students) plus adults who will recieve safe water. Hope this explanation clarifies the situation in this area of northern Uganda. This seems like a feasible project. Our only concern is the exchange of animals or crops rather than money for the maintenance fund - it may be difficult to pay for spare parts with this. Also, it has been mentioned in other projects that the well maintenance fund is included in the school fees so if the well is predominantly for school children then this may be a viable option. Hope your project goes well. Would like to see project succeed in a new area away from LW-Kenya. Great experience and a proven engagement model. It would be great to see more government capacity building and contribution. It's always a challenge I know! This is a very good and well designed program.